Description: K651 power for the Tropicana juice train has cut off at Locust in Philly to pick up some intermodal cars to be added to their run westward. Here, the conductor directs the engineer to the coupling. Description: Q400 gets on the move after hanover fire has to assist him with an engine fire on the RLCX leasor second in the consist. Description: One of two salvagable slides from a store-ruined set. It took me a good hour of PS work to clone out all of the dings and scratches. Jerks. Nothing's helped by the fact that this was a rather awful day with wretched flat lighting. Description: Train pulled up past diamond and then backed up about 15 cars to leave some cars in the CSX/NEC transfer track. 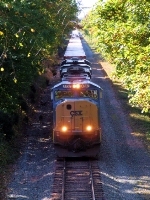 Title: Backing down the transfer track. Description: These shots are taken at the Palmer Station which has been completely refurbed and now houses a fabulous restaurant called the Steaming Tender. We ate there and had a great meal. 4 trains passed within 15 feet of our table while eating. Highly recommended! Description: Two of EMD's finest moving through Emerson at just a little less than track speed. Title: Q149 screams through Bogart trying to make up for lost time from a slow order near Auburn. Description: CSX K375-06 seen rounding the curve into Sterling interlocking. Description: North Greenwood Ave., 1331 hours.